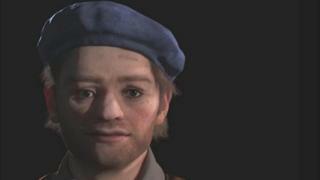 The face of a Scottish soldier captured in a Civil War battle more than 350 years ago has been revealed after being digitally reconstructed from a skull. He was buried in a mass grave in Durham, with up to 29 others, and was found during building work in 2013. Archaeologists later established they were prisoners from the 1650 Battle of Dunbar, incarcerated in the cathedral. Research on the remains, led by the Durham University, established he was aged between 18 and 25 when he died. It was also determined he had suffered periods of poor nutrition during childhood and had lived in south west Scotland during the 1630s. Prof Chris Gerrard, from the university's department of archaeology, said the reconstruction gave people a "remarkable, and privileged, glimpse into this individual's past". The Battle of Dunbar, in south east Scotland, ended in the crushing defeat of a newly recruited and unprepared Scottish army by English Parliamentarian forces, led by Oliver Cromwell. An estimated 5,000 Scottish soldiers were taken prisoner and marched more than 100 miles to Durham. Many died along the way, some were executed and some escaped but about 3,000 were incarcerated in the cathedral, which was at that time empty and abandoned. During the hard winter of 1650-51, it is thought up to 1,700 died of malnutrition, disease and cold, and were buried in mass graves. Research on the skulls unearthed at Durham showed evidence of the prisoners being aged between 13 and 25, having suffered poor nutrition or illness during childhood and rampant tooth decay. One of the skulls, of a male known only to the project team as "Skeleton 22", was sent to Face Lab at Liverpool John Moores University, which specialises in the reconstruction of faces for archaeological and forensic purposes. A detailed digital scan was carried out and combined with the lab's specialist 3D modelling software, and the archaeologists' findings, to build up the facial features. Prof Gerrard said: "The resulting image is a poignant opportunity to come face to face with a young man who lived and died over 300 years ago." Prof Caroline Wilkinson, from Face Lab, said: "Our collaboration with Durham University enabled us to draw on scans and data to create the most accurate and lifelike image possible to enable a true glimpse into the past of this Scottish soldier and how his life had been lived. "It will join a collection of work by Face Lab reconstructing historical figures including Robert the Bruce, Richard III and St Nicholas." Of those who survived their incarceration, some were employed locally in coal mines, at salt pans and as weavers, while others were sent to King's Lynn in Norfolk to help with drainage projects on the Fens. A number went further afield - across the Atlantic to places such as Barbados and New England, USA, where they worked as indentured servants in ironworks and sawmills. The Scottish soldiers project is ongoing and, when complete, the remains will be reinterred at a cemetery in Durham.